Today I discovered the first two eggs laid by our Rhode Island Reds–a feeling that took me back to the Easter-egg hunts of my childhood. Eggs for breakfast tomorrow! 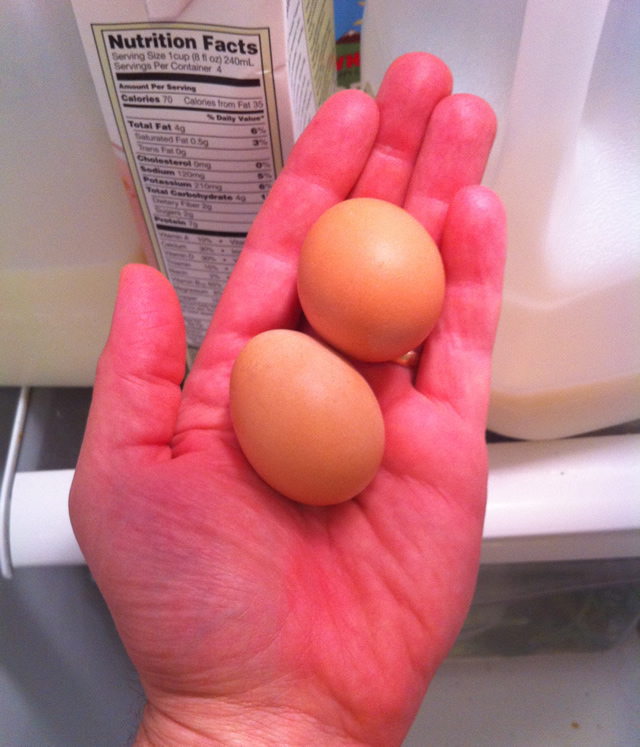 The hens are only nineteen weeks old, and we did not expect them to start laying for two more weeks. Now we have to scramble (so to speak) and set up their laying boxes and adjust their feed from a growing ration to a laying ration. OK, I promise that will be the last egg pun. Once the hens are laying in full swing, we will post pricing and pickup details on the “To Order” page, so please check back in a couple of weeks.